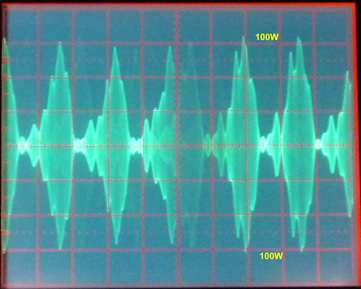 The following is a brief procedure for measuring SSB PEP (Peak Envelope Power), using an oscilloscope with a vertical bandwidth of at least 20 MHz1, or a monitor scope. This technique is termed the "oscilloscope transfer method". Note 1: Definition of PEP: Peak Envelope Power (PEP) is the average power supplied to the antenna by a transmitter during one radio-frequency cycle at the crest of the modulation envelope taken under normal operating conditions. Note 2: In RF power metrology, the Crest Factor (CF) is defined as the ratio of PEP to average power. In the CW modes (CW, RTTY, FM), CF = 1. In SSB, depending on voice characteristics, average power may run 50% to 65% of PEP (CF = 1.53 to 2). In properly-adjusted AM, average power at 100% modulation = 1.5 X resting carrier power, and PEP = 4 X resting carrier power, i.e. CF = 2.66. Note 3: The oscilloscope is a far more accurate PEP measuring tool than even a "peak-reading" RF power meter, as it will display the crest (peaks) of the modulation envelope independently of the rise-time, audio-frequency response or spectral distribution (power density) of the transmitted signal. Connect the equipment as illustrated in Fig. 1. The Bird 4273 line sampler2 is an excellent choice. (The Bird Electronics 4274 sampler element3 fits any Bird element-style wattmeter. The separate line sampler shown in Fig. 1 is not required when using the sampler element; simply connect the oscilloscope vertical input to the sampler's BNC output.) Bird products are available at RF Parts. A line sampler can also be made up by inserting a coaxial T-fitting in the feedline, and loosely coupling the branch of the T to the vertical input of the oscilloscope via a 1 pF high-voltage capacitor at the fitting. Set the timebase to a fairly slow sweep rate (e.g. 10 msec/div). Connect the transmitter output via the line sampler to an RF power meter accurate to within ±5% or better (e.g. a Bird 43) terminated in an accurate 50 ohm resistive load. Ensure that the internal autotuner (if fitted) is OFF. Select RTTY, key the transmitter and set the RF output to read 100W on the Bird. Adjust the vertical gain on the oscilloscope for a convenient display size, e.g. 6 div. P-P. Note the ALC meter deflection on the transmitter. Select SSB mode with compression off, speak into the microphone and adjust Mic Gain for the same ALC meter deflection as noted in step 6 above. Observe the peak-to-peak amplitude of the SSB RF envelope. Adjust the oscilloscope timebase for convenient viewing of the envelope. If the Mic Gain is correctly set, this amplitude will be 6 div. P-P, as in step 5 above. (Refer to Fig. 2.) This corresponds to 100W PEP RF output. If the above procedure shows a significant difference between the RTTY and SSB PEP output, there may be a problem in the transmitter. When reading PEP, an oscilloscope will always read peak values more accurately than a meter, as its rise-time is practically instantaneous for our purposes. Even a bar-graph meter may have a longer rise-time than an oscilloscope. Prolonged uttering of the word "FIVE!" as in FIIIIIIIVVVVVVVVEEEEE! provides a particularly useful test signal. The succession of peaks readily stands out and if the peaks are sharp and clean at their tops, you can be assured of a clean SSB signal without clipping or distortion. Modest compression or soft peak limiting shows as a gentle rounding of the speech peaks, rather than the abrupt flat-topping associated with hard clipping. Also observe the ratio of the total amount of coloured area on the scope screen whilst speaking into the microphone, as compared to the CW or RTTY pattern. That ratio is roughly the difference in average power between the key-down CW state and SSB. Compression and other processing will show up vividly as an increase in the amount of coloured area displayed. 1 This is not a critical parameter. Any oscilloscope with sufficient vertical bandwidth to display the RF envelope is usable. 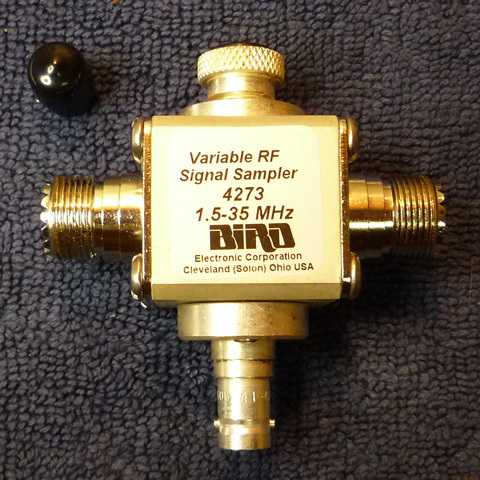 2 The Bird Model 4273 is a wide range device that provides a variable, unrectified signal at about -40 to -70 dBc ± 5 dB from 2-35 MHz. 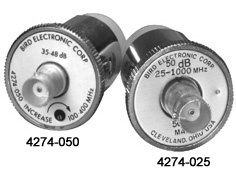 3 The Bird Model 4274-025 is a wide range device that provides an unrectified signal at about -50 dB ± 2 dBc from 25-1000 MHz tapering to -66 dBc at 2 MHz. Join the Radio Test Gear Group. I use one of my scope's vertical-amplifier channels as a wideband amplifier, by hooking up the frequency counter to that channel's output connector. By properly setting the selected channel's vertical attenuator (level switch), I am assured a good working level for the counter.